Rabbits may be cute and cuddly, but they’re not the sort of animal you want freely invading your garden. They make great pets because they love to play and hide—but they also love nibbling on things. Those precious plants in your garden are a perfect lunch for many wild rabbits. Personally, I have had many problems with rabbits in my yard over the years, however, I don’t want to harm them. That would be like trapping Thumper in Bambi, or Hazel in Watership Down, both bunnies from my childhood. Let’s take a look at some of the best rabbit repellent products on the market which can keep those little bunnies away. There are numerous natural ways of keeping rabbits out of your yard, like those detailed in the YouTube video below. Another method is to use a commercially available rabbit repellent. These will often take the form of a liquid which you spray or granules to be sprinkled on the ground, around your prized plants. These products tend to be made from non-toxic and natural ingredients. A rabbit repellent will work either by creating an odor which deters the rabbit, or altering the flavor of greenery to stop it munching on the stuff. 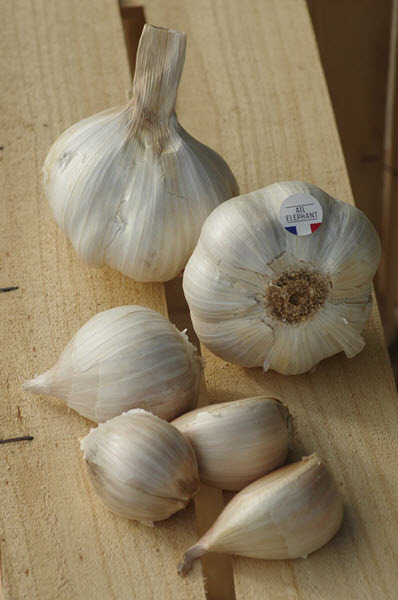 Oil from garlic can be used in odor repellents. These are the most common types of repellent, which create an odor that drives away the rabbit before it has a chance to eat your plants. Natural substances used may include garlic oils, putrescent egg solids, blood meal, bone oil or ammonium. Although the smell can be quite overpowering when you first apply the spray to your garden, normally it will subside. Most sprays actually go on the surface of the plants and, although safe for digestion, can taint the taste of some food products. This is bad news if you’re growing edibles to eat. A better alternative is to spray around the perimeter of your garden or yard, to create an odor barrier. Some repellents will work on the basis of fear and create an odor of a dead animal, using dried blood or meat meal. The natural instincts of the rabbit will cause it to leave in fear of a predator being nearby. 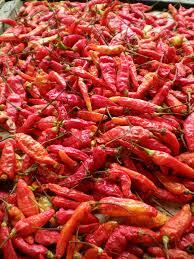 Oil or sauces from spicy peppers can be taste repellents. Much less common are repellents which alter the taste of the plants—you want to stop the rabbits taking a bite in the first place. Ingredients that can be used to dissuade rabbits from taking any further bites include: fermented or putrid eggs, hot pepper sauces, and fungicides. Unfortunately, many of these ingredients are not as safe as odor compounds and should only be used on ornamental rather than edible plants. In addition, a rabbit will sometimes, if extremely hungry, eat anything and try to ignore the bad taste. Odor repellents are, in most cases, more effective than a taste-based method. You should always check with both odor and taste-based repellents, that they are safe for your garden and other occupants of your household. If you have younger children or family pets, ensure that any repellent is non-toxic and free of added synthetics. Some compounds can even be of benefit, as they break down into sources of nutrients for your garden. With so many rabbit repellent products available, it may seem the whole world hates rabbits. It can also be confusing trying to decide which is the best product for you. The following five repellents all use natural ingredients and are safe to use in your garden for you and your family. 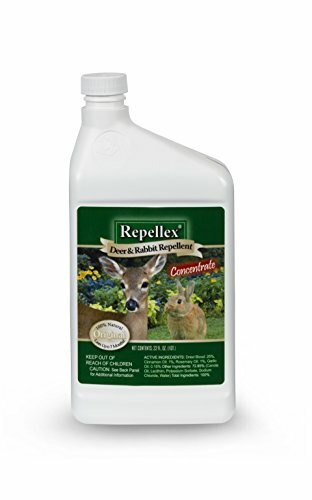 The Repellex Deer and Rabbit repellent concentrate uses a combination of smell and taste to keep rabbits away from your plants. This unique liquid has been designed to stick to organic surfaces, like leaves or shrubs, and will offer 90 days of protection. All natural ingredients include dried blood, garlic oils, and hot pepper, to create a dual barrier that affects the pest’s smell and taste. Supplied as a ready-to-mix concentrate, a gallon of solution will be adequate for 120-160 plants. You simply spray the diluted mix onto the leaves or stems of your plants and walk away. The manufacturer recommends applying on dry days, and to reapply after a rain shower for best results. Repellex concentrate does have a strong odor when first applied, but this dissipates after 24-48 hours. A red pigmentation in the dried blood can also stain lighter colored plants, but the staining often disappears after a few rainfalls. Active ingredients bond to the plant walls for maximum effectiveness. These can be undesirable on edible plants. Although dried blood is said to be the most effective repellent, sometimes rabbits can become immune to it. Once they have found there is no danger, they will no longer be afraid. Repellex tries to counter this with the taste of garlic and hot pepper, but often this is too late and half the plants have been eaten. Repellex is one of the less expensive rabbit repellent sprays and, with it sticking to the plant better, you will use less. However, it may not be as effective as more expensive sprays that have higher levels of active ingredients. Many gardeners find rotating this spray with other repellents is more effective than solely relying on Repellex. Active ingredients force the repellent to bond with the plant surface, making it last longer and more water resistant. Combines fear, odor and taste, to keep away rabbits and other pests. Organic ingredients are safe for use in households with pets or small children. Concentrate lasts much longer than the ready-mixed spray bottles which are available. One of the very worst smelling sprays: the bad odor of rotten eggs and garlic does die down after 24-48 hours, though. Sticking to the plant surface will affect the taste of the plant: great for scaring off rabbits, not so great for edible plants. Red pigmentation found in dried blood will discolor many plants. Concentrate can be thick, even when mixed correctly, and will clog up smaller spray bottles. Liquid Fence is one of the market leaders in the outdoor repellent market, with many products available. The company makes repellents for mosquitoes, dogs, cats, rats, and even snakes. 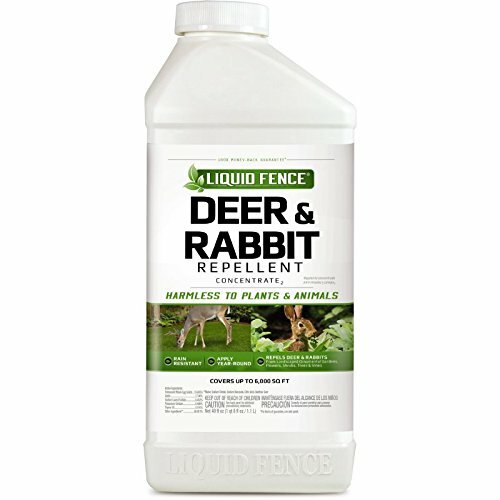 For rabbits and deer, there are three different products, including a ready-mixed spray, granules, and the concentrate we are looking at here. The concentrate is the most popular of the rabbit repellents and features the most powerful and concentrated chemical composition. A 40-quart bottle of the concentrate will cover up to 6,000 square feet, more than most other rival products. You simply mix about 8 ounces of the concentrate in a gallon of water before spraying your garden. This is a repellent which uses odors to stop the foraging before it even begins. Using natural rabbit deterrents, like putrescent egg solids and garlic, it certainly smells. Fortunately, the smell dies down, with ventilation, about a day after spraying. All the ingredients used in this product are safe for your pets, family and desirable plants. The manufacturer recommends you renew this product after two weeks within the first month, and thereafter, spraying is monthly. Being a liquid concentrate, it is important you note this product may be washed away by rain or water. Try to ensure the solution dries completely or settles after spraying. Many customers have found Liquid Fence to be effective in keeping their yards and gardens rabbit free. Although, I’ve heard complaints that the new formula is weaker and won’t cover as large an area, needing more concentrate for dilution. New formulas are rarely popular—does anybody remember the new Coke fiasco? Overall, this is a solid product which is effective at repelling rabbits, deer and other rodents or pests from your garden. It may cost slightly more, but the concentrate is more powerful than many others and lasts longer. Longer lasting and can last up to a month without reapplication. Repels other pests and rodents. Safe to use around pets and plants. Expensive. The new formula doesn’t cover as much area as stated on the bottle. Can leave plants looking messy. Strong odor when first applied. Restricted in New Mexico and Indiana. Unlike the other spray-style products, this rabbit repellent from Enviro Pro comes in a granular form. Instead of spraying onto the leaves of the plants you simply scatter a protective strip around your plants and beds. It can even be sprinkled over your lawn to stop rabbits from entering the garden. 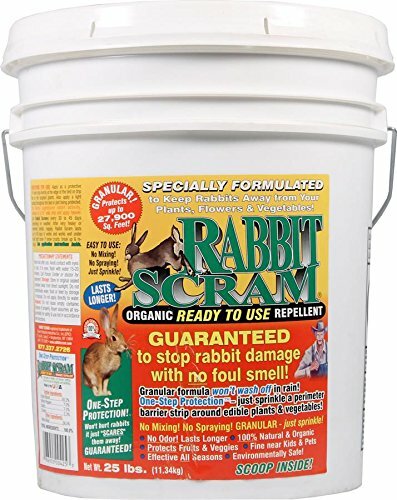 The Rabbit Scram granules use organic ingredients to stop the rabbits with biology. The two main ingredients, dried blood and meat meal have a smell for rabbits which is similar to their dead kin. Alerted to the danger, a genetic biological defense mechanism causes the rabbit to flee from potential predators. As the brand name suggests, this product has been manufactured to be eco-friendly. With only natural ingredients, it is biodegradable and decomposes into organic nitrogen nutrients which are good for your soil. With no synthetic additives, it is safe to use with pets and doesn’t have a bad odor for humans. Used regularly, Rabbit Scram repellent will create a barrier that rabbits won’t cross over to munch on your plants. The granular application remains effective and won’t wash away in the rain as many spray repellents do. Some customers have claimed that, after the initial application period, the granules can work for up to 45 days. If you don’t like the idea of constantly spraying foul-smelling solutions on your plants, these granules offer an alternative repellent. For those of us who live in wetter climates, the granules can be ideal as they don’t wash away as easily as liquids. Granular formula with no mixing or spraying required. No direct contact with the plants, simply a barrier at the base of each plant. More water resistant than traditional liquid sprays. Long lasting, with regular application recommended every 45 days. No unpleasant odor for humans when dry. Breaks down into soil beneficial nitrogen nutrients. Water is said to make the granules more active but also increases the odor. Can be very unpleasant after heavy downpours. Pail which the Rabbit Scram is provided in can be cumbersome and the lid is difficult to remove. Smaller 6-pound shaker bottles may be more suitable. Doesn’t cover large areas–using recommended 18-inch strips, the granules quickly run out. Can be expensive in the long run. If you don’t like the idea of mixing up your own solutions of bad smelling repellents, this product from Liquid Fence is supplied pre-mixed and ready for use. This spray uses the same natural ingredients of putrescent egg solids and garlic as the Liquid Fence concentrate. No more taking a bite out of your rose bush first, the natural rabbit deterrent odors will keep them well away. This repellent is said to be rain resistant and long lasting in the repelling of rabbits and deer. You can apply it with confidence at any time of the year and still expect the same results, regardless of the season. Liquid Fence is so confident of the effectiveness they offer a 100 percent money-back guarantee. Liquid Fence products are safe to use on edible plants and won’t affect the taste or cause any harmful effects if ingested. For environmental concerns, it’s both eco-friendly and biodegradable, ensuring the safe use for your garden and household pets. The “just spray” application makes it easy to use, although it is more suited to individual plant beds or bushes than to larger open areas. Overall, this bottle of premixed solution with built-in spray is ideal for use in small gardens. The fine mist dries without any odor and is just as effective as the concentrate versions of Liquid Fence repellents. Easier to apply, just spray and go, for a quick and effective solution. Environmentally safe to use on plants and won’t harm edible crops. Can be used to protect trees, landscaped ornamental gardens, vines and shrubs. Rain resistant and long lasting. Works all year round. Dries without bad odor and is biodegradable. Spray bottle is not designed to spray larger gardens. Not cost effective to be used on open spaces. Some spray bottles reportedly don’t work too well. Time-consuming and unpleasant to decant into another container. 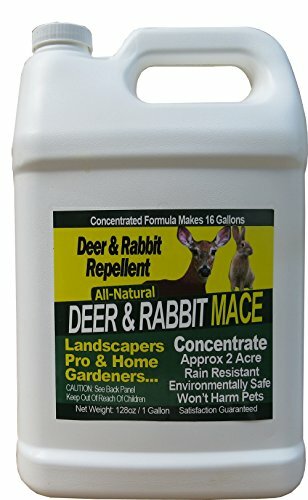 When looking for a concentrated type of rabbit repellent you can mix with water for more applications, Nature’s Mace Rabbit repellent is an ideal choice. Unlike granular types of repellent, a concentrate is a lot easier to manage, especially on larger areas, where you can use a sprayer or watering can. The manufacturer claims that this product has three times more active ingredients than competitor products. Natural ingredients, including egg solids, garlic, white pepper and mint oil will cause discomfort to rabbits and deer but are safe for the family pet. We particularly liked the fact that this product is safe to use in vegetable gardens without any concerns. The combined ingredients use a mixture of scent, fear and taste to keep the rabbits from munching on your plants. Although it smells bad when first applied, you won’t notice the odor once it dries and settles. Liquids like this, as a rule, don’t tend to work too well in moist environments or areas where there is heavy rainfall. The product is much more effective when it is allowed to set to dry. Once set, the application can last several weeks. Despite being one of the more expensive repellents available, you will cover a large area with many applications of this solution. The one gallon container makes about 16 gallons of the mixture. It’s effective in keeping rabbits, deer and many other rodents from your garden for year-round protection. Just be cautious when choosing this product. It may not be suitable if your location is prone to storms. Covers large areas, many users argue you can just create a perimeter around your garden/yard with the concentrate. Long lasting once it has settled. No bad odors for humans after it dries. Will repel deer and other rodents too. Safe for use around human, pets, and plants. Can be washed away easily by rain. This solar powered nocturnal pest repeller offers a different but still humane way of repelling rabbits from your garden. 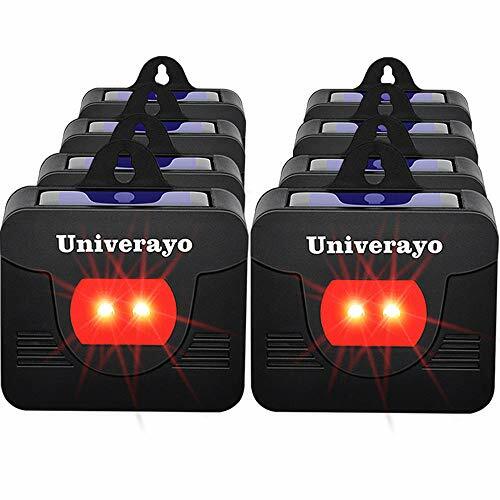 An upgraded version of earlier models, the Univerayo now features two red led lights that simulate fire or predator eyes to scare away the animals. Although designed for creatures like coyotes, bears or squirrels, at the right height, it can be effective in repelling rabbits. These predator control lights offer a non-toxic and humane way of keeping rabbits from your garden. Compared to spraying foul-smelling formulas, the Univerayo system offers a low maintenance way of keeping the rabbits out. As they are solar powered, five hours of charge during the day will last up to 12 hours at night. An automatic light sensitivity turns on at dusk and off at dawn, emitting flashing red lights during the night. When the rabbits or other rodents see the lights, which can flash at up to 180 times per minute, they assume its fire, or another predator, and flee. Available in a pack of four or eight units, you simply place them around your garden with an estimated area of a ½-mile long and 800 feet wide for each unit. The new and completely waterproofed design of the units makes them suitable for use in all weather conditions. You can fix the predator deterrent lights to any outdoor surface, like a tree trunk, post or wall, to deter nocturnal animals all year round. The light can also mimic a home security system, which may scare off potential thieves and intruders. Very low maintenance, just fix to a surface and switch on. Solar powered, with no need for external wiring: environmentally friendly. Weatherproof and can be used all year round. Multiple units can be set at different heights and angles, to cover the whole garden and deter larger pests too. The obvious disadvantage is they only work at night! They may be more effective if to they were motion-activated, rather than flashing all night long. No random pattern like other units. Limited mileage, some rabbits and nocturnal animals may become accustomed to the lights. All the products we have looked at will help you keep your garden free of rabbits and their late-night munching habits. Whether you want to go down the electronic deterrent route or applying a spray/granules is a matter of personal preference. Although the predator style night lights may seem low maintenance, you have to wonder how effective they will be over a longer period of time. 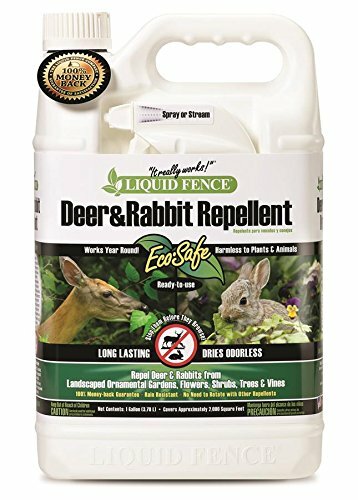 Our choice for the best spray rabbit repellent would have to be the Natural Mace’s Deer and Rabbit Repellent Concentrate. It may cost more money than some of its competitors, but it will last you much longer. Even though you don’t like the idea of rabbits in your garden eating your plants, you don’t really want to kill them, do you?